With a huge sigh of relief and exasperation, Corrigan carries in the last box from your much-anticipated move. The finish line is near, but you’re not quite there yet. 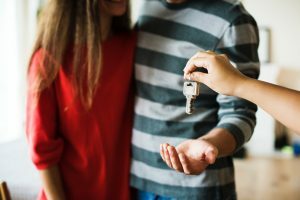 There are a few more final details you need to take care of before you are completely settled into your new home. Here are some key things to take care of right after you move in. Whether you used a moving company or handled the efforts yourself, the first thing you should do is make sure everything made it to the new home safe and sound. Inspect the contents of the boxes, the furniture, and even the appliances to make sure that everything is in one piece and functioning. Inspecting your boxes should be done immediately, especially if you had movers move you. There is often a short window of time to file any damage claims, so take care of that right away. Inspect your new home as well. Even if you completed a walkthrough before the move, it’s essential to conduct another one now. Anything can happen in the few days, weeks, or even months between your inspection and move-in day. Feel secure and confident in your new home by changing the locks. Various previous owners undoubtedly had additional spare keys made and handed them out to neighbors or relatives, etc. You can’t be sure how many extra keys might be floating around there. Changing the locks is a simple solution for safety and peace of mind. Check your smoke detector and carbon monoxide detector and make sure they are working correctly. Check the batteries to see if they need replacing. Make sure that they are situated in the proper positions and that they are loud enough for all family members to hear in case of an emergency. Also, make sure your new home is equipped with a fire extinguisher. Unpacking all of your belongings is a daunting task that can quickly turn into a disorganized mess if you don’t have a plan. The ideal way to tackle unpacking is to make an unpacking list. Start by making a list of each room. Remember to include closets, garages, and basements. Then prioritize each room based on the need and frequency of its use. Next, set a schedule for unpacking each room based on your prioritized list. Plan to spend about 30 minutes unpacking smaller boxes with more items and 10 minutes unloading the larger boxes with bigger items. Submit a change of address with the post office, but don’t stop there. You will need to change your address with more people and companies than you realize, like banks, credit card companies, rewards programs, and online shopping sites such as Amazon for example. Remember to register your vehicle at your new location and have your driver’s license updated as well. Moving to a new home is exciting. You probably want to dive right in and start with some big projects that may include renovation. But, give yourself time to settle in first and get to know your new home and how you use it. Then start with small projects as you shape your house into your cozy new home. Need Help With the Move? If you’re planning to move, we’ve got you covered! Get a free quote today.